It is a brightly coloured Balloon Bauble. If an item is not clearly dated an estimate of age may be given based on its appearance and any information I may have about the history of the item. It is in good condition for its age. 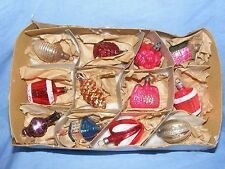 Selection of very old glass christmas decorations. Tiny bristle Christmas tree, baubles and a snowy effect. Vintage unusual decoration - wise man or king. fantastic rare and unusual approx 12cm tall. good condition. Please take a look at my other items. It is a brightly Gold & Pink coloured Balloon Bauble. If an item is not clearly dated an estimate of age may be given based on its appearance and any information I may have about the history of the item. Age related wear to paint/2 scrolls are missing (see pics). Depth 2.6 cm. box cover is missing. Hand made, hand painted, lacquer finish. (candle holders are shiny and difficult to photograph). 11 vintage Christmas tree glass baubles, one bell,two painted, three dropperone silk and four balls All hangers and caps intact. Some paint dulling/scuffs due to age. With a large Concave middle and a finial droplet. If an item is not clearly dated an estimate of age may be given based on its appearance and any information I may have about the history of the item. 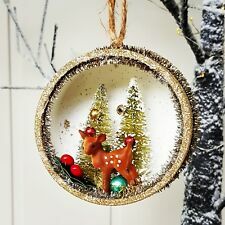 Item: 5 plastic Christmas decorations. Used, cleaned, wear to paint (see pics). With a large Concave middle. Approx Mid-Century, 1940's. If an item is not clearly dated an estimate of age may be given based on its appearance and any information I may have about the history of the item. Christmas Tree Decorations. decorative Christmas Tree Decorations. From our quality Premier Decorations Christmas Range. adding a great look to your Christmas décor. Champagne Gold flowers. Marked 'Maison Barbellion 70 New Bond St' to the inside of the lid. Depth at the top 3 cm. depth 2.5 cm. If an item is not clearly dated an estimate of age may be given based on its appearance and any information I may have about the history of the item. It is in reasonable condition for its age. A SPOT OF CHRISTMAS CHEER. TREE HANGING CHRISTMAS TEA POT HOUSE WITH CHIPMUNK INSIDE. READY TO HANG ON CHRISTMAS TREE. APPROX 7 CM TALL 9 CM LONG. HAS ORIGINAL BOX IN LOVELY CONDITION. Selection glass christmas decorations. The pictures show front and back. CB68 These are boxed as shown. the are all Teardrop shaped Double-Concave Indented Baubles. they have a Concave Indent on two sides. If an item is not clearly dated an estimate of age may be given based on its appearance and any information I may have about the history of the item. 2 glass berries, silk trim bow. If an item is not clearly dated an estimate of age may be given based on its appearance and any information I may have about the history of the item. They are in reasonable condition for their age. The baubles were bought a few years ago and never used. Box is in good condition with minimal wear, see pictures. Get into the Christmas cheer with this charming set of 6 Glass handprinted Baubles. Handmade with paint and a whole lot of love. Each Bauble is hand painted in gold and a corresponding colour and finished with a satin ribbon. Approx 1980's. If an item is not clearly dated an estimate of age may be given based on its appearance and any information I may have about the history of the item. It is in reasonable condition for its age. 3 Huge real Pine-Cones, decorated with artificial sprigs of fir, berries and red ribbons and a double set of Red Bells. If an item is not clearly dated an estimate of age may be given based on its appearance and any information I may have about the history of the item. Vintage bauble containing elf, green metallic and clear plastic. fantastic rare and unusual approx 5.5cm / 6cm diameter. very good condition. Please take a look at my other items. Hand made, hand painted, lacquer finish, movable head and arms. If an item is not clearly dated an estimate of age may be given based on its appearance and any information I may have about the history of the item. Hand made, hand painted, wooden base. He is in a Satin Sack and has a Plastic Face. All in good condition, his head is slightly coming away from the sack, so be careful when hanging. Original hanging loop attached. See all photos for full condition report.